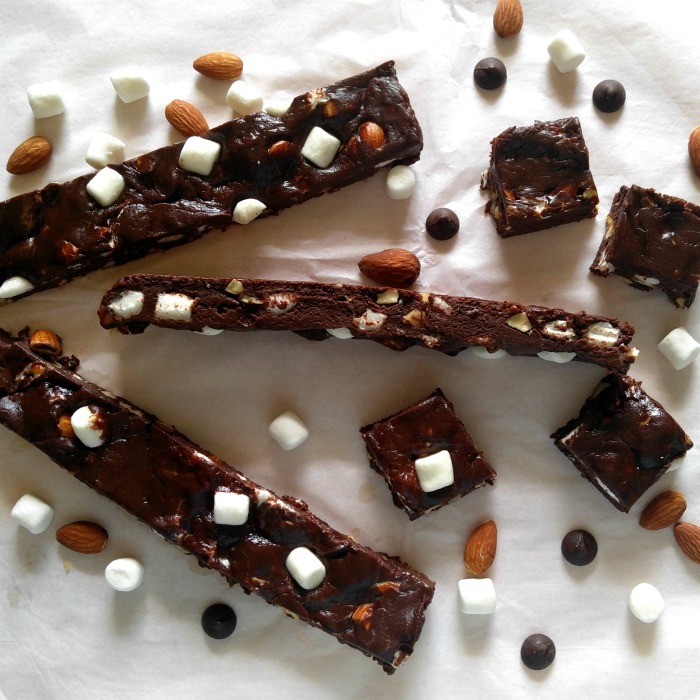 This Rocky Road Fudge recipe is just about one of the easiest fudge recipes you will make. And don’t let the snobby cooks scare you into thinking that you need a great deal of patience and a fancy candy thermometer to make fudge! Making fudge does not have to be hard. This delicious holiday treat comes together in just minutes, in the microwave, and sets well in a few hours in the fridge. The fudge is a delicious combination of sweetened condensed milk with dark chocolate and miniature marshmallows. 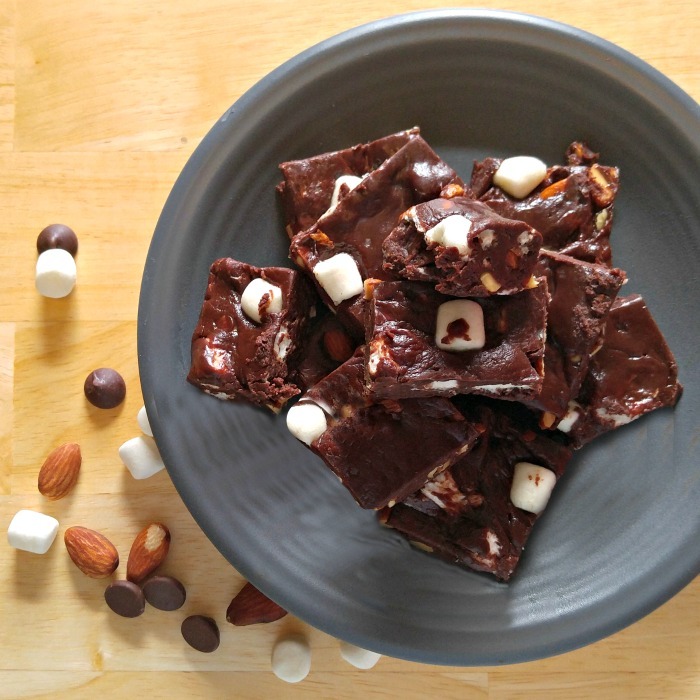 The fudge has a lovely crunch that comes from the roughly chopped almonds and a bit of saltiness from the coarse sea salt. 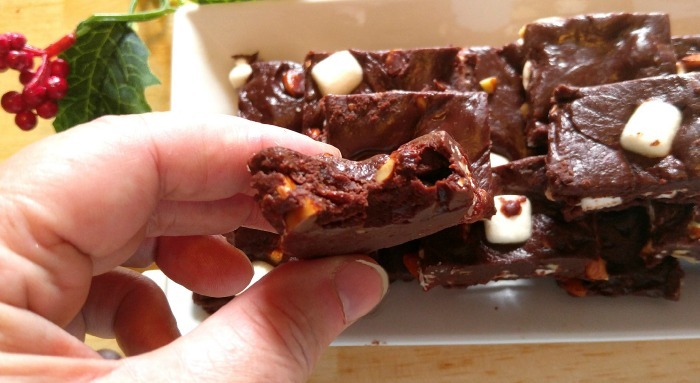 It’s time to make the Rocky Road Fudge. I made this fudge in the microwave. 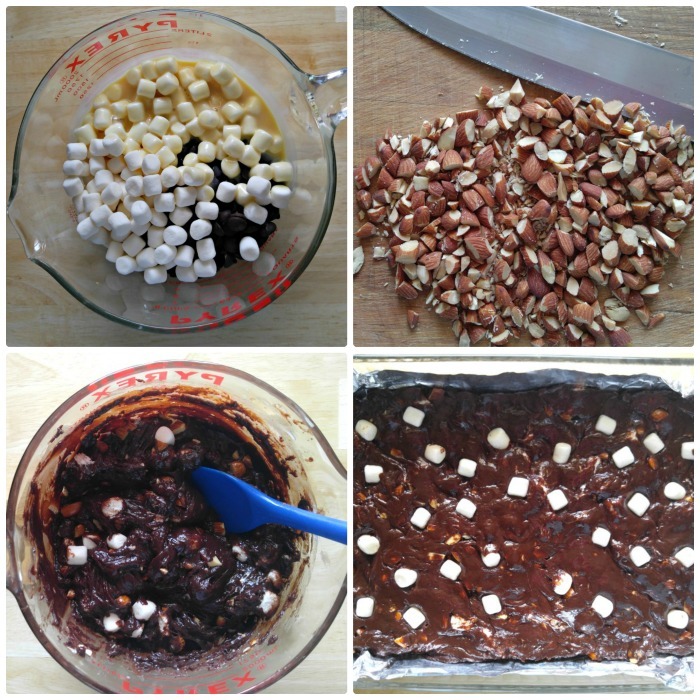 One thing that I LOVED about it is that the addition of the marshmallows in the bowl, when the chocolate is melting, gave the mixture a lovely consistency that made it not only easy to stir, but also to blend, mix and pour into the prepared pan. It is, by far, the easiest fudge I have ever made. The biggest problem you will have is not devouring the whole pan as soon as it has set. IT IS THAT GOOD!! There is just something about all those ingredients that just seem to go together as though they were made for each other! 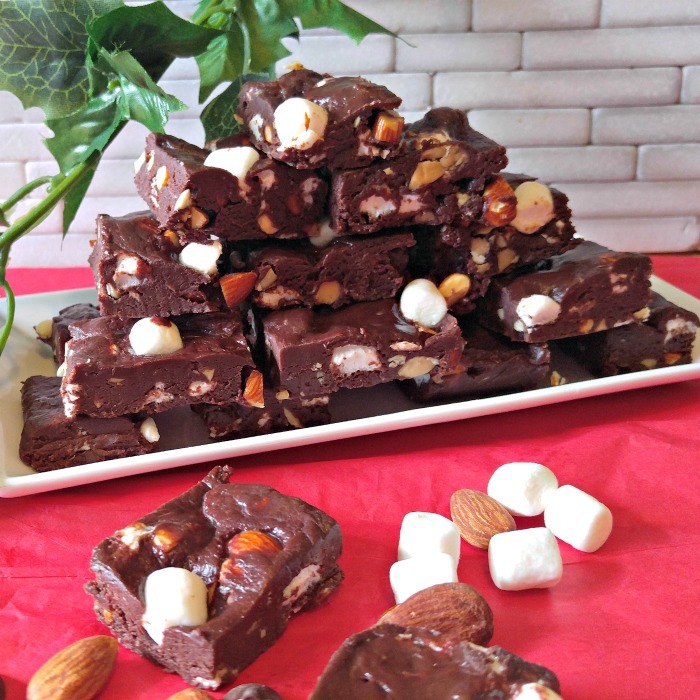 If you love the memory of hot chocolate with mini marshmallows in it, you are in for a nostalgic treat with this delicious Rocky Road Fudge. My husband, who loves Rocky Road ice cream declared this as his favorite fudge. That is high praise coming from a man who is not fond of fudge. 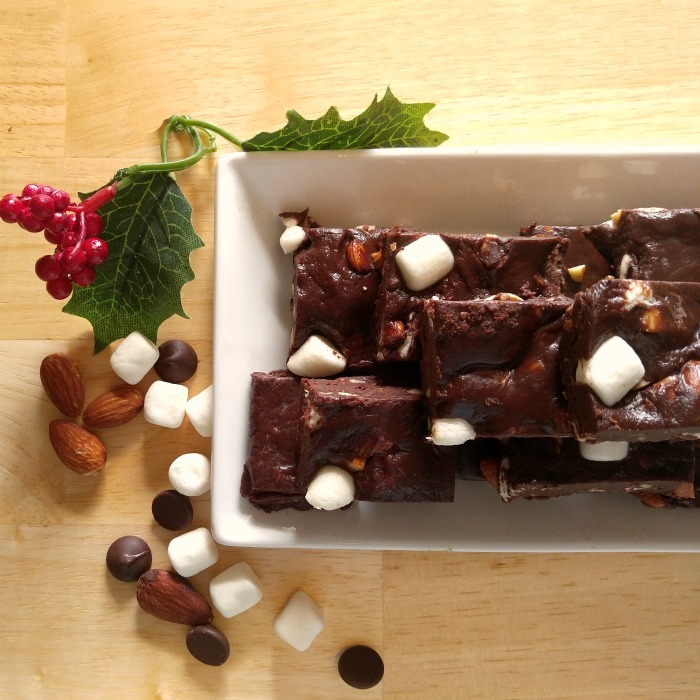 This Rocky Road Fudge is perfect for Thanksgiving, perfect for Christmas…awww heck…it’s just perfect for any occasion. Promise! For more delicious candy recipes, be sure to visit my Candy Creations Pinterest Board. Line 8x11.5 baking dish with aluminum foil and butter the bottom and sides of the pan. In a skillet, toast the almonds for 3-4 minutes over medium low heat. Roughly chop and set aside. In a large heatproof bowl, combine chocolate, 2 cups of marshmallows, condensed milk, vanilla extract and salt. Place it over simmering water (make sure the bottom of the pan doesn't touch the water) and slowly melt everything until smooth, stirring frequently. Remove from heat and stir in remaining 1 cup of marshmallows and almonds. Pour it into the prepared pan and leave for at least 2 hours, or overnight to harden. Cut into 24 squares and serve. Store the fudge at room temperature, or in the fridge, covered, for up to 5 days. You can also freeze this fudge, tightly wrapped, for up to 3 months. When ready to serve, slowly thaw the fudge in the fridge, still wrapped, overnight, then bring it out to room temperature. Line an 8 x 11" baking pan with parchment paper and spray the bottom and sides of the pan with a cooking spray. In a large microwave safe bowl, combine the chocolate, butter, 2 cups of the mini marshmallows, the sweetened condensed milk, and sea salt, and cook in 1 minute increments until it is smooth and silky. (It took me 3 minutes.) Stir in the vanilla extract and stir to combine well. Stir in remaining 1 cup of marshmallows and the chopped almonds. I added a few extra marshmallows on the top at the end. Pour it into the prepared pan and let it sit for at least 2 hours, to harden. Cut into 40 squares and serve. Store the fudge in an air tight container, at room temperature, or in the fridge, covered, for up to 5 days. This fudge also freezes well, tightly wrapped, for up to 3 months. temperature.